Nigeria's President Umaru Yar'Adua has ordered an investigation into last week's Islamist uprising, which left hundreds dead. He said this would include the death of the sect's leader, . Yusuf was arrested but then shot dead. Police say he was killed in a shoot-out when he tried to escape but rights groups say it was a summary execution. His Boko Haram sect attacked several police stations across the mainly Muslim north. The sect said it was fighting against Western education and believed Nigeria's government was being corrupted by Western ideas and wanted to see Islamic law imposed across the country. Meanwhile a video has emerged on the Youtube website showing Yusuf under police interrogation after his capture. Someone off-camera is heard to say: "You have caused the deaths of many innocent people." Speaking in the local Hausa language, he replies: "Those who have been killed, have been killed." The BBC's Caroline Duffield, in Nigeria, says people who knew Yusuf have confirmed that the man on the video is the sect leader. Police chief Ogbonaya Onovo has denied his force took part in extrajudicial killings. "We operate according to civilised standards of behaviour," he said. 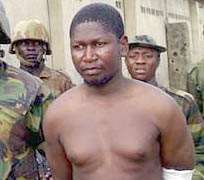 Mr Yar'Adua said Yusuf's killing would be investigated "together with the overall events that have happened". He said a post-mortem examination on Yusuf's body had been ordered, and a preliminary report should be ready before the weekend.